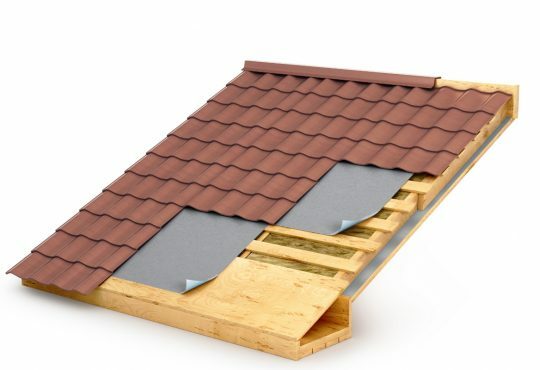 Has the roof on your home started to fail? Have you noticed a stain on your ceiling, or worse yet do you have a roof leak that is damaging your home? 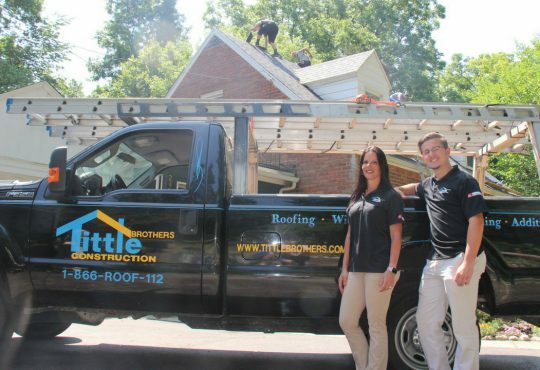 When it’s time to get a new roof installed making sure you know all the options that are available to you can help you make a much better decision about your roofing. One of the most popular roofing materials used in Plymouth Michigan today is asphalt roof shingles. Asphalt roof shingles in Plymouth Michigan are the number one roofing material for a good reason too. It’s economical, looks great, and lasts a long time. 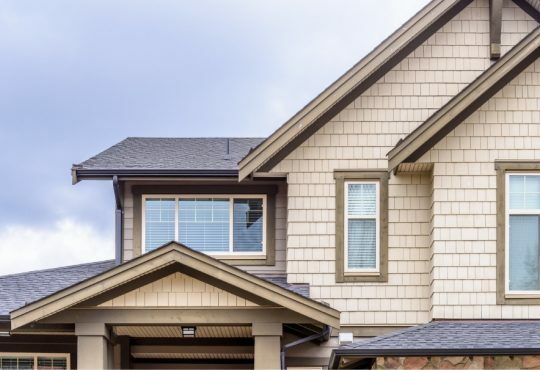 Listed in this article are some of the reasons why this roofing material is so popular but also why you may want to pause before selecting it for your Plymouth Michigan home. 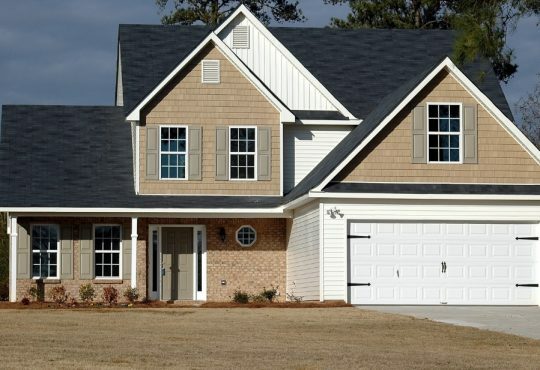 One of the most popular roof shingle materials is asphalt roof shingles in Plymouth Michigan. But, is asphalt roofing as exceptional as everyone says it is? Check out our pros and cons of asphalt roof shingles to decide for yourself before you get a new roof installed on your Plymouth Michigan home. One of the biggest pros of asphalt roof shingles in Plymouth Michigan is its lightweight composition. Asphalt roof shingles are primarily made of asphalt, which is essentially a blend of fiberglass and various organic materials. This lightweight composition ultimately plays a role in the other pros, such as price and maintenance. Like previously stated, asphalt roof shingles are lightweight, which means they are easy to manipulate and install. Therefore, installing asphalt roof shingles doesn’t take as much time or labor as other roof materials. So, installing asphalt roof shingles is generally cheaper than other roof materials. Another great pro of asphalt roof shingles is its low maintenance quality. 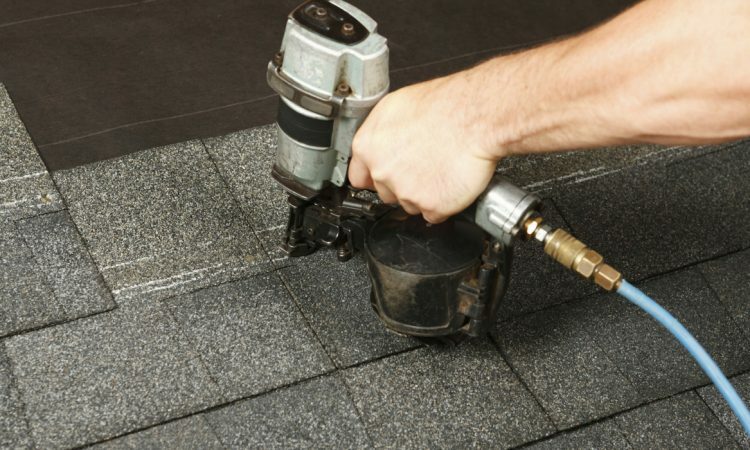 Asphalt roof shingles are one of the easiest types of roof shingles to repair. Also, their inexpensive price plays a key role in maintenance because in the event that you need to repair a shingle or two, you won’t have to worry about breaking the bank to do so. There are a ton of different colors, designs, and textures of asphalt roof shingles. Essentially, you can have whatever kind of roof design and aesthetic you want with asphalt roof shingles. Some asphalt roof shingles even resemble more luxurious roof materials, such as slate and wood. Unfortunately, asphalt roof shingles are not the most durable roof material. In fact, asphalt roof shingles aren’t that great at protecting your home from inclement weather. 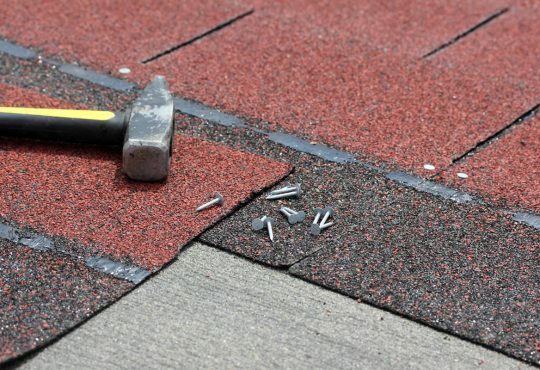 For example, harsh rain and high winds are known to loosen asphalt roof shingles, which create granule shedding and build-up, as well as missing shingles, which could ultimately cause leaks and other structural damage. There are asphalt roof shingles that can stand the test of weather but are a bit higher quality. In other words, you get what you pay for. Another con of asphalt roof shingles is their poor structural integrity. Conditions, such as ultraviolet ray exposure and extreme heat are known to speed up the aging process, as well as cause discoloration and other problems in asphalt roof shingles. So make sure the warranty you receive with the roofing materials is long enough to cover any potential problems down the road. In addition to ultraviolet ray exposure and heat, excess moisture has a tendency to get trapped in asphalt roof shingles, which causes things such as moss and mold to grow. Getting a roof inspection done every year can prevent any problems with mold or mildew on the roof. This usually doesn’t show up in an area like Plymouth Michigan however. Overall, asphalt roof shingles are a phenomenal roof material. They are budget friendly, low maintenance, versatile, and have a lightweight composition. 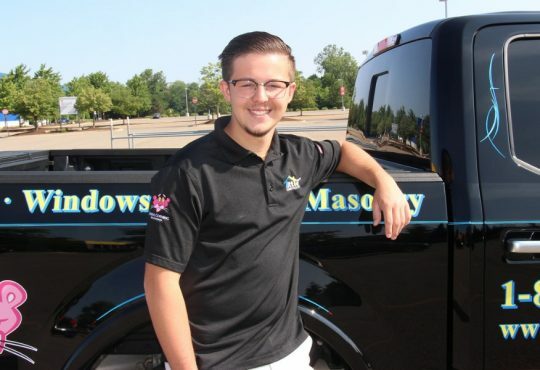 But like anything, asphalt has a few cons, such as having a poor structural integrity and lack of durability. 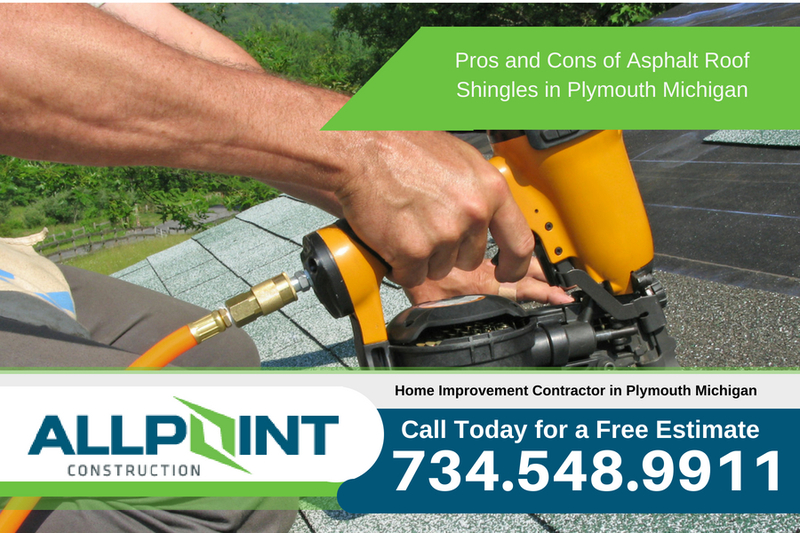 Ultimately, it’s your responsibility to weigh the pros and cons of asphalt roof shingles in Plymouth Michigan. 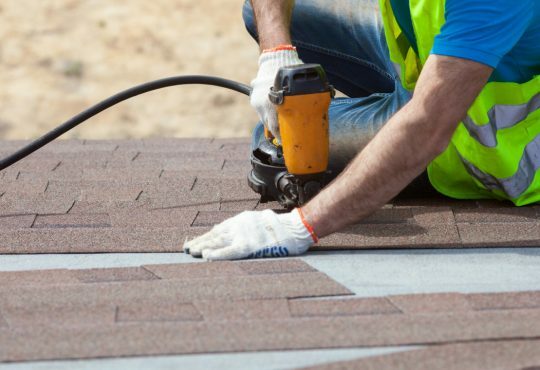 Whether you want to learn more information about asphalt roof shingles, or you’re ready to install an asphalt roof, contact Home Pros Plymouth for more information today. Home Pros Plymouth offers free consultations on roofing projects in Plymouth Michigan.